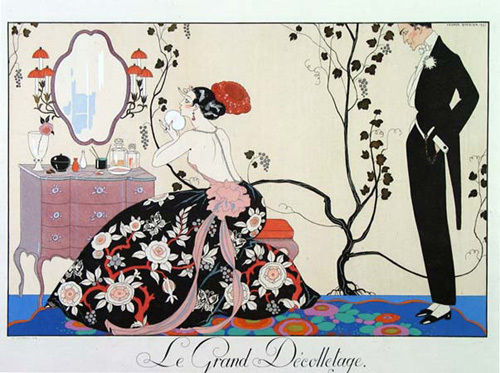 BARBIER, Georges. Le Grand Décolletage. Le Bonheur du Jour, ou les grâces à la mode. This past Saturday, alone and at loose ends, I called Lisette. 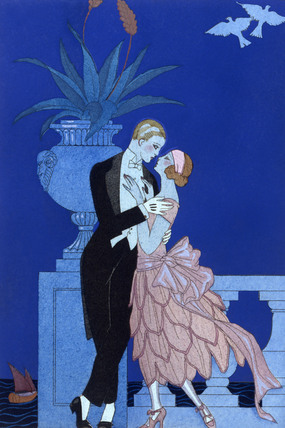 She was, as ever, loose, so we made plans for the evening, a night on the town in Paris and pleasure. I stopped by to pick her up. An hour later, she was still involved with her Grand Turning, transforming herself into a siren and I was duly alarmed. I just stood there, in awe. All I could think was, Aw, if there is a God, I’m under that dress by midnight..
We stopped to sup. We had the soup. There was a fly in it. Performing a languid tarantella, as our waiter informed us when we asked what it was doing there, the fly, apparently, in the midst of an inter-insect identity crisis. Afterward, Jocelyn, Lisette’s special friend, stopped at our table to say hello and comment upon Lisette’s gown, which she had, at the last minute before leaving home, put on instead of the wearable, floral patterned yurt I’d planned on being inside of under cover of darkness and Lisette. “And so are you, Lisette,” Jocelyn said. I looked into Lisette’s eyes and saw what Jocelyn was talking about, a thousand tiny lenses looking back at me as if I was a granule of refined sugar. Sweet night ahead! We asked Jocelyn to join us; we desperately wanted to stick together. But Jocelyn insisted that we remain single so that the three of us could continue into the evening without her feeling like a third wheel. 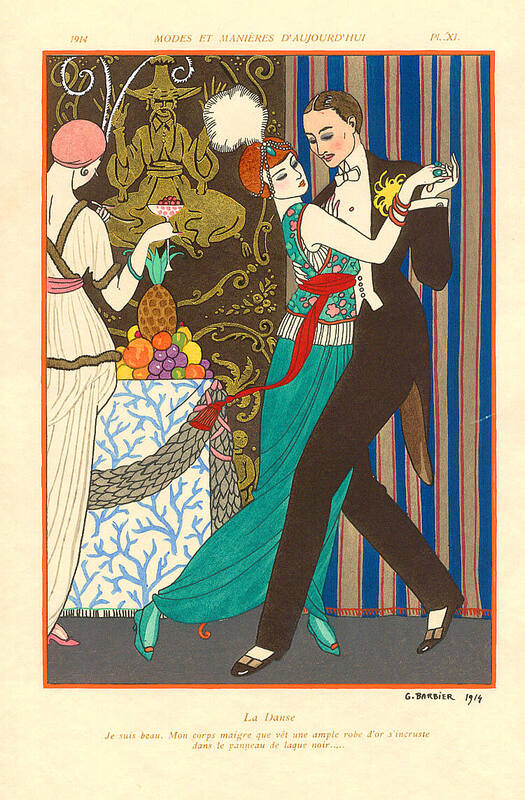 We wheeled over to Danse Macabre, the popular night-spot. A troglodyte manned the velvet rope. He refused us entry but I slipped him a mickey and he let us in before losing consciousness. “Always tip the bouncer,” I told the ladies as his head bounced on the sidewalk. We breezed in. 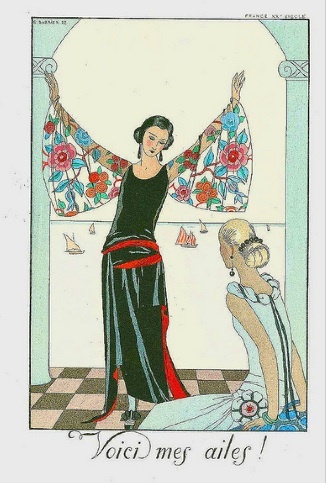 Lisette excused herself, and when she returned she was wearing yet another gown. I, during the interim, grew a mustache and put some eye shadow on. While Lisette and I danced, Jocelyn drank the joy-juice flowing from the Chinese God’s phallic fountain into her champagne coupe full of cherries. Jubilee, my friend, a real jubilee it was. You know me, Al. We danced until the cows came home. When they arrived it became too crowded so we ditched the bovine for divine and further delights. 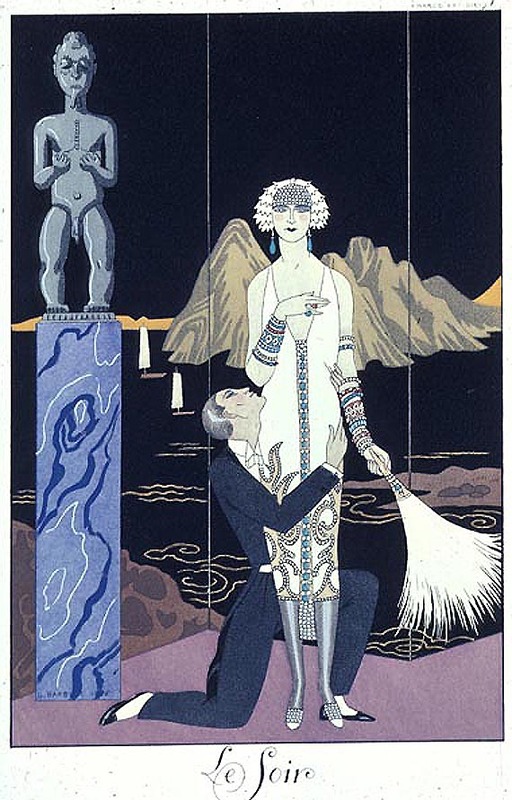 BARBIER, Georges. Le goût des laques (Taste of Lacquers). Don’t ask me why but Lisette and Jocelyn had a yen for a taste of lacquers so we stopped at a lacquer store, picked up a bottle and settled in a Japanese park comprised of a few vivid screen panels, just off the Champs-Élysée. They - once again! - changed their clothes, and the two of them huffed lacquer fumes while I stood aside and watched them get giddily shellacked. Jocelyn wandered off, we knew not where, led by the hallucinations she was now following in a trance. “If you promise not to change your gown again I’ll take you to a palace of infernal pleasures,” I begged Lisette, now garbed as a goddess. “Oui!” she replied, but not before changing her outfit once more. I swear, she had a walk-in closet in her purse. She wasn’t a clothes horse; she was a clothes whale and craved fresh clothing, a lot of it, as if it were krill. A moment later, two birds shat on my spats. Auspicious omen! Time to evacuate and get this party started. So we both used the bathroom and then went on our way. Pops Marchande was waiting for us. You know me, Al, most parties I wind up checking out the books in the library. So, I go into the library and, yikes!, there’s Lisette draped over pillows on the floor, to all appearances in a state of post-coital bliss, lazily smoking a cigarette as if she had been doing it all her life instead of starting just fifteen minutes before when she donned a smoking pantsuit and was inspired by it to begin, despite the Surgeon-General's warning medallion on the front of the garment. Jocelyn, who had, apparently, followed her favorite hallucination, was at her side, spent, and lost in ecstatic reverie. That being the reason we attended Pops Marchande’s party in the first place, the three of us glided into the den. 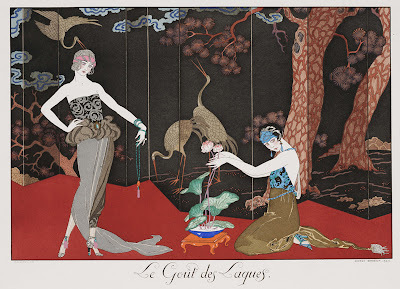 BARBIER, Georges. 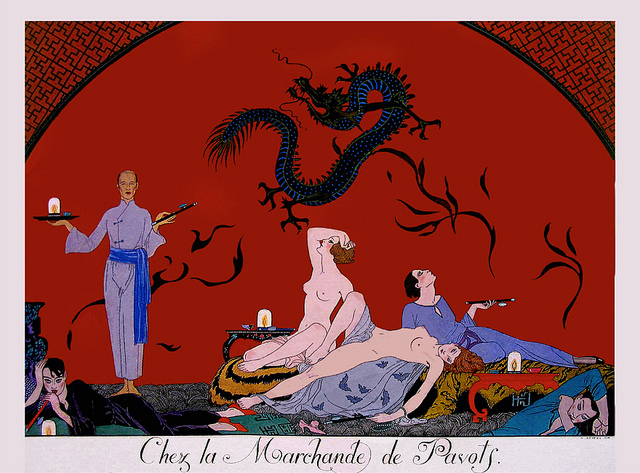 Chez la Marchande de Pavols (House of the Poppy Merchant). There was Pops Marchande, holding an opium tray and pipe, awaiting us. 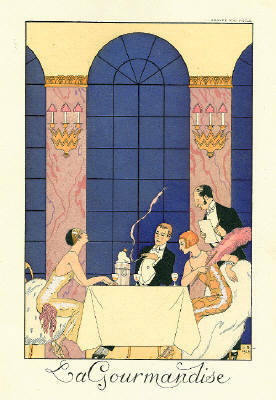 And sprawled on the floor and across pillows were five women in dishabille, each a dish and highly dishable. You know me, Al. When I bang the gong, I’m gone. What happened next, I have no idea. 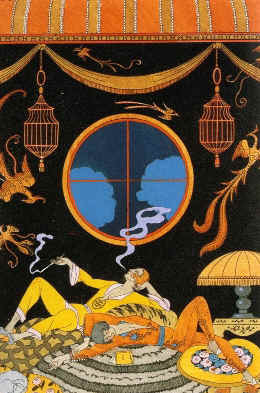 But I have a vague recollection of a bunch of women in the throes of opium-soaked rut, running their tongues all over me and each other, kisses from all directions on all parts, caresses that began and never stopped, and the sense that we were all drifting upon a cloud of silk that soothed as we floated upon a zephyr. It was nice to see Lisette without any clothes on for a change. While it lasted. Dawn broke and it was time for us to get dressed and leave. Lisette, Jocelyn, and I said our goodbyes, and Ho Chi Minh, an Indo-Chinese dishwasher in Paris and part-time chauffeur working for Pops Marchande, drove the two of us back home. BARBIER, Georges. Voici des ailes! (Here are my wings!). We were both still rather dreamy from opium. It was a nightmare for me, however, when gum-on-my-shoe Jocelyn appeared out of nowhere; there was no scraping this woman off. "Here are my wings," the flapper said to Lisette, who had not only changed into yet another gown but had dyed her hair blonde before bedtime. Gay Paree. Don't ask, don't tell. You didn't, I did. Sorry. I'm joining the Foreign Legion. 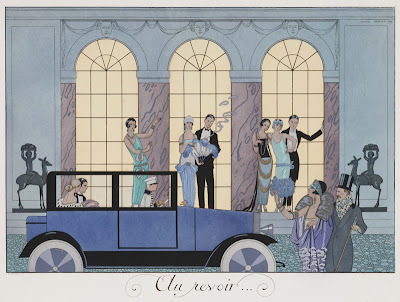 Apologies to Georges Barbier and Ring Lardner. Booktryst revisits Georges Barbier and his exquisite illustrations in pochoir in In Paris with Scott, Zelda, Kiki, Ernest, Gertrude, Etc., and Georges Barbier. Originally appeared November 15, 2010.